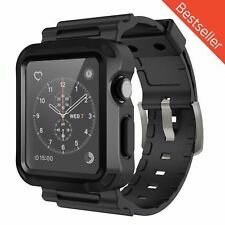 Apple Watch Series 1 MP032LLA 42mm Aluminum Case Smartwatch - Grey. Condition is Brand New Factory Sealed Shipped with USPS Priority Mail with tracking and insurance within 1 business day of received payment. Extend your iPhone with the sleek and stylish Apple Watch. This 42mm watch is designed to be comfortable when worn on the wrist as well as practical with a myriad of helpful features, from a heart rate sensor to Wi-Fi capabilities. With 18 hours of battery life, all you have to do is charge the watch overnight and you'll be good to go the next day. The speaker and microphone are high quality for taking phone calls and playing music. The Apple iWatch digital touch screen displays all information in bright and easy-to-read text. It's also highly water resistant, which means that your investment won't be ruined when it rains. The band is black and the casing is aluminum, so it will look as fashionable as a standard watch. Everything great looking, nice watch, a minor scratch nothing to feel bad about it, but the microphone doesn't work at all. And thats an option i will use a lot, cant talk to siri, pick calls nothing. Was very excited till now. Excellent, But make sure it's really a series 1. The Apple Watch series 1 is an incredible smartwatch, much better than Fitbit, or Samsung. Clear Retina display, and too many features to count. Super fast running WatchOS4. But be careful. Many people are selling watches claiming to be series 1, but are really the old Series 0 model. The series 0 model has a much slower processor, and is super slow. Here's how to tell the difference. The Series 1 watch says, "Series 1" on the back, and the serial number is printed in the cavity that holds the band. The Series 0 says, "Series 7000", or "316L stainless" on the back and has the serial printed clearly on the back as well. It makes no mention of Series 1. The box of a Series 1 will have printed on it, "Series 1", but the Series 0 will just say, "Apple Watch Sport". At first I was worried about buying a refurbished Apple Series 1 watch, but once I got it and opened the box it looked brand new! It works great like a new watch! I’ve only had it for a couple of weeks, but I use it everyday and haven’t had any problems yet. Have looked for a while about buying an Apple Watch, buying new or used/re-furbished. Found VIPOutlet, saw others reviews, and gave it a go. Got two used/re-furbished Apple Watches 1st Gen, saw their grading system, guarantee, etc. Got the watches quicker than est. delivery. Opened both and inspected them, BOTH looked like BRAND NEW, even though were rated "B" on their rating system. One watch had to do an update, but both synced up fine with our iPhones, and so far so good.